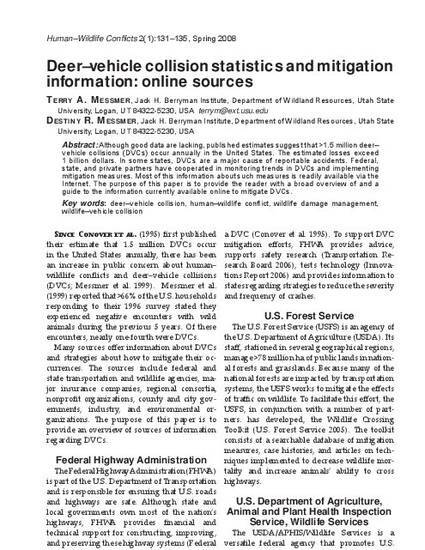 Although good data are lacking, published estimates suggest that >1.5 million deer– vehicle collisions (DVCs) occur annually in the United States. The estimated losses exceed 1 billion dollars. In some states, DVCs are a major cause of reportable accidents. Federal, state, and private partners have cooperated in monitoring trends in DVCs and implementing mitigation measures. Most of this information about such measures is readily available via the Internet. The purpose of this paper is to provide the reader with a broad overview of and a guide to the information currently available online to mitigate DVCs.